DOMS for dummies: the top five scientific muscle soreness cures! – Is it healthful? DOMS for dummies: the top five scientific muscle soreness cures! You walk into the office and are faced with a flight of stairs. 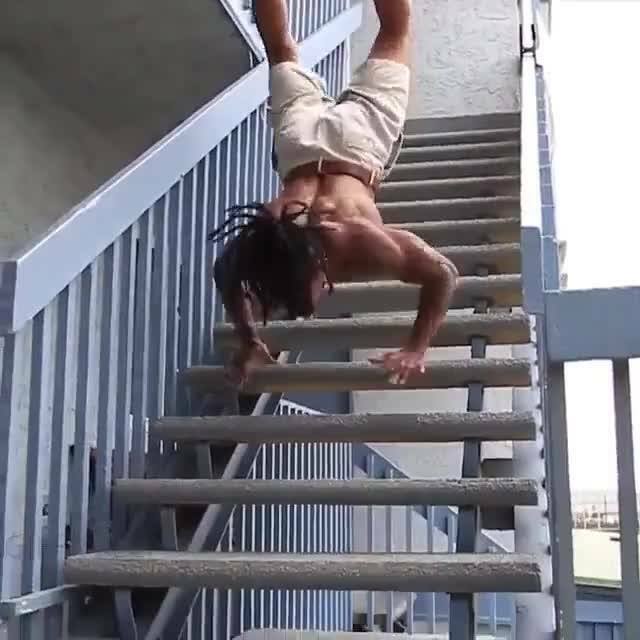 Normally you would ascend those stairs with ease and a certain amount of grace. But not today. No, yesterday was leg day and you climb those stairs like a drunken elephant on rollerblades. You are experiencing DOMS (delayed onset muscle soreness) and you are experiencing it bad. Is there anything you can do about it? Yes. Yes there is. So, without further ado here are the top five science based cures for DOMS. I lied, a bit of ado first. Stretching (see my other blog), ultrasound therapy, fish oil supplementation and magnet therapy have all been shown to have no effect on DOMS (8, 9, 11). Protein supplementation appears to improve muscle mass gains in the short-term, but sadly it has no apparent effects on muscle soreness (10). Rats. Here, have some more ado. Branched chain amino acid supplementation shows a lot of promise. Currently the scientific evidence is mixed – likely due to different dosing regimens and study designs. One study found branched chain amino acid supplementation to have no effect on DOMS pain and recovery (12). One study reported it only decreased DOMS in females, while another reported it to decrease DOMS pain by 10% in all individuals (14). Because of these mixed results, we can’t yet put branched chain amino acids in the top five. Sorry. Coming in at number five is massage following exercise. Massage therapy has been found to definitely improve DOMS. Oh, but only by half a point on a 10-point pain scale. It’s unlikely that this change in pain has any effect on athletic performance in the coming days (1). Despite its humble benefits, this still appears to be the fifth best treatment for DOMS based on current scientific evidence. Ice packs have a very slight effect on muscle soreness, but scientific evidence indicates they don’t improve performance in the days following exercise (2). Slightly better, or possibly even on par with massage. Let’s look elsewhere. It gets a bit better at number three. Cold water immersion which can refer to having an ice bath, taking a dip at the beach, or soaking the limbs in cold water helps. It has been found to decrease DOMS slightly, reducing fatigue during exercise by 20% and overall pain levels (3). Contrast therapy, swapping from hot to cold water repeatedly, appears to have similar effects, so we’ll put this under the same category at number three for you (7). Not number one, but not far off. Compression garments decrease muscle soreness moderately and improve muscle power and strength when compared to no compression in the days following exercise (4). Yes, that means both pain and performance improvements. Here’s a tip, try wearing your compression tights the night of exercise and the following day(s), as this may lead to even further benefits. Obviously wash them at some stage during this period. And the number one cure for DOMS is………..foam rolling. Yes, foam rolling. It has been demonstrated in two different studies to decrease muscle soreness moderately and in one study to also improve performance moderately (5, 6). For maximum effect roll immediately after exercise. Why this is so much more effective than massage is unclear? Perhaps it’s the fact that the roller is more able to get into fascial tissue (superficial gluey tissue). Or maybe it’s that foam rolling can be performed straight after exercise more easily than massage. Who knows? It appears to work, so I ain’t gonna question it. So you know what works, but how about trying combining foam rolling, wearing compression garments and immersion therapy, the top three. The combined effects could be quite substantial. Also, I would try supplementing with branched chain amino acids after exercise, as they likely aid in increases in muscle mass and with further studies could be proven to decrease your deadly DOMS. Nice! Very useful information. I will try to add it in my post exercise routines. Thanks! Thanks Peter. Hope you’re having a great day/night. Wow, I love this article! I always thought stretching was suppose to help. My muscles are sore from a workout I did three days ago! I should look into getting a foam roller. Thanks! Thanks, Crissy. Appreciate the comment. Yeah, it’s surprising, stretching is something that we’ve just done for years, but there is actually minimal scientific evidence supporting its effectiveness. Fascinating. I love that most at times I try forcing my to do little exercise. But ending up frustrated. I think this one will motivate me a lot. Thanks, smogniceguy. Hope you have an excellent day. Reblogged this on Recipes, quotes, poems, politics, photos etc.. I agree with foam rolling. After I pulled a calf muscle and couldn’t run for a few weeks, I bought a cheap one. Hurt like hell while using it, but next day no more muscle pain. I tell all my runner friends about them and after trying them they love them. Good stuff, Kerry! No pain, no gain. Nicely written and good post, but DOMS isn’t just about the soreness you feel after exercise. It is more specifically characterised by the inability to generate the same muscle tension/force as before exercise. Thus it can be considered that these ways of alleviating DOMS are not entirely true. Other than that, I enjoy your blog! Thanks for the comment. Yeah that’s true, there are other symptoms of DOMS. However, there is a strong correlation between reported soreness and loss in muscle strength. Furthermore, if I’m to compare different interventions from different studies, I need to look at the same outcome, in this case pain levels. Pain levels are generally measured using a visual analogue scale (1-10), whereas strength is often measure differently between studies. Thanks, Tracey. You’re too kind. ← What do you think is the best way to prevent DOMS (post-exercise muscle soreness)?